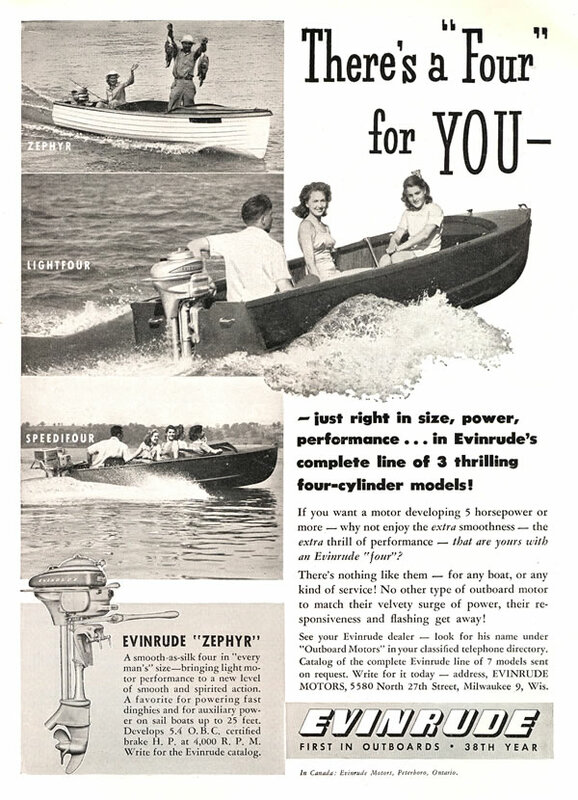 SURE IT'S A FOUR - An Evinrude Zephyr! Light as a twin, smooth as silk, and a real power house! Sounds almost too good to be true! 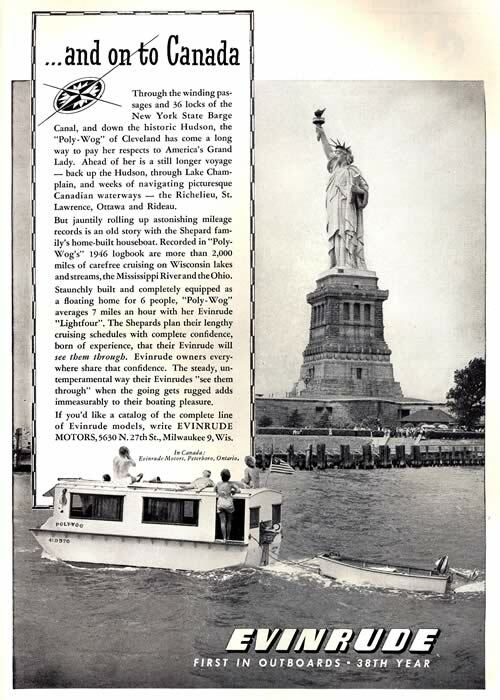 But take the word of delighted "Zephyr" owners from coast to coast that it is true! Right in the range of two-cylinder power, weight and price you can enjoy matchless four-cylinder performance! The wonderful smoothness of 8,000 balanced, overlapping power strokes per minute! Exceptional starting ease! Thrilling responsiveness, and flick-of-the-throttle flexibility from slow trolling glide to surging top speed! 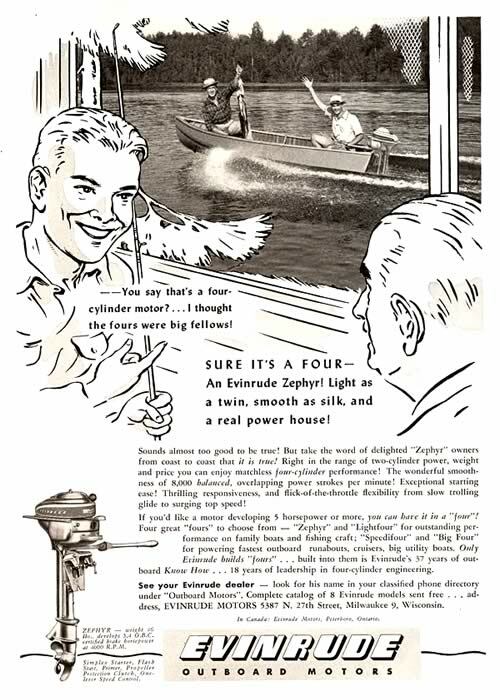 If you'd like a motor developing 5 horsepower or more, you can have it in a "four"! 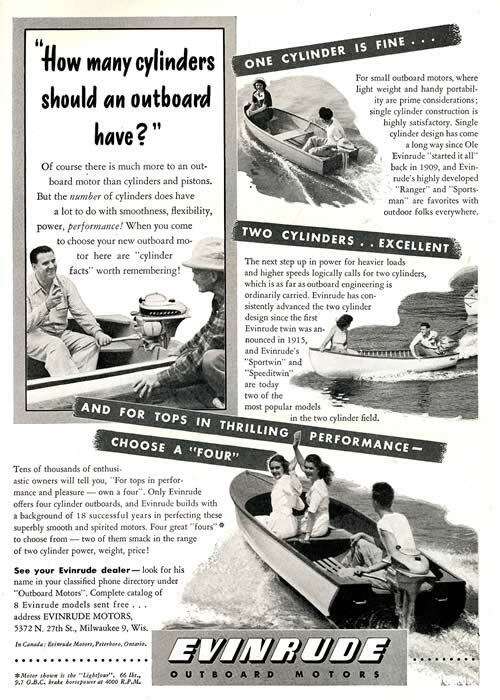 Four great "fours" to choose from - "Zephyr" and "Lightfour" for outstanding performance on family boats and fishing craft; "Speedifour" and "Big Four" for powering fastest outboard runabouts, cruisers, big utility boats. 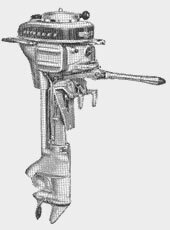 Only Evinrude builds "fours"... built into them is Evinrude's 37 years of outboard Know How ... 18 years of leadership in four-cylinder engineering. 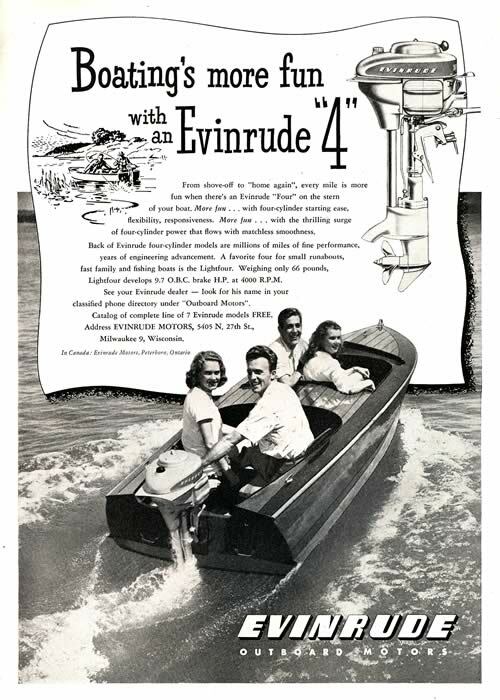 Manufacturer: EVINRUDE MOTORS, Milwaukee, Wis.
- just right in size, power, performance... in Evinrude's complete line of 3 thrilling four-cylinder models! 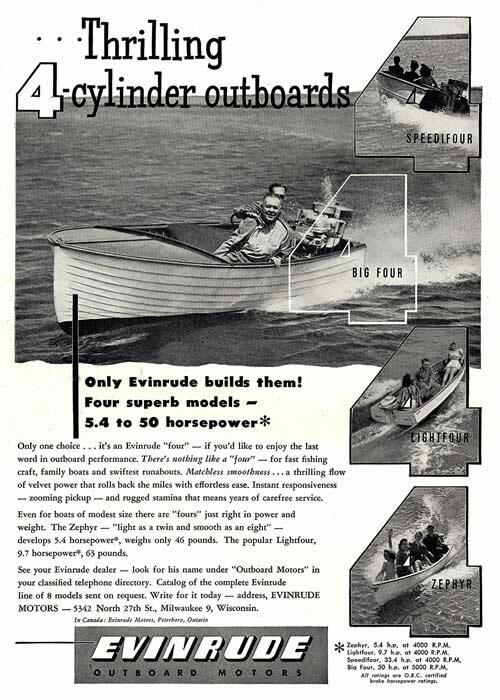 If you want a motor developing 5 horsepower or more - why not enjoy the extra smoothness the extra thrill of performance - that are yours with an Evinrude "four"? 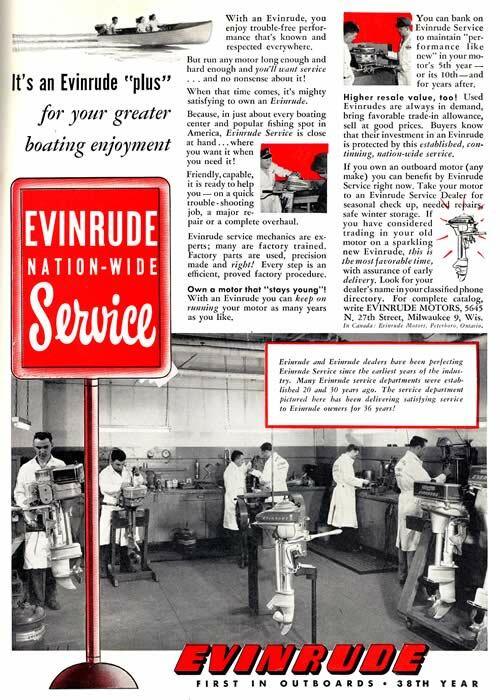 There's nothing like them - for any boat, or any kind of service! 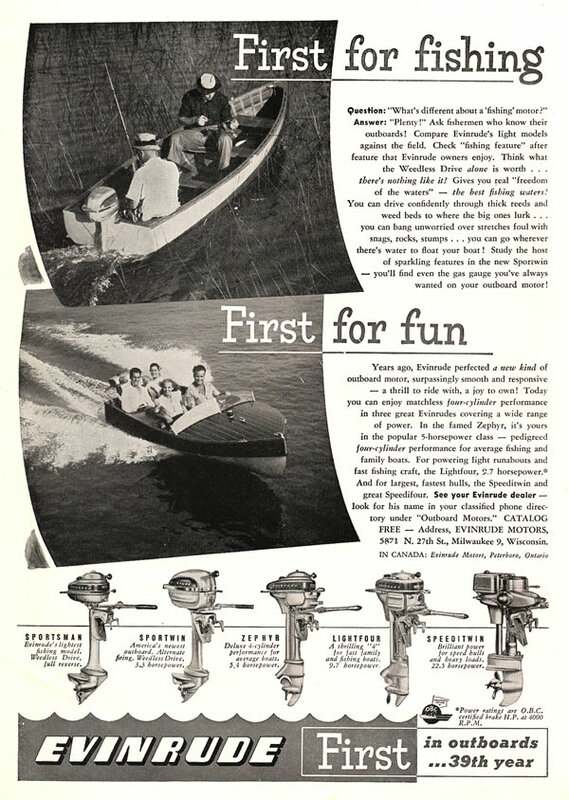 No other type of outboard motor to match their velvety surge of power, their responsiveness and flashing get away! 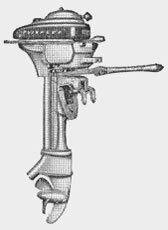 Question: "What's different about a 'fishing" motor?" Answer: "Plenty!" 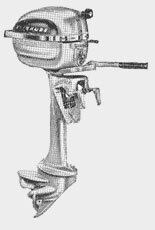 Ask fishermen who know their outboards! 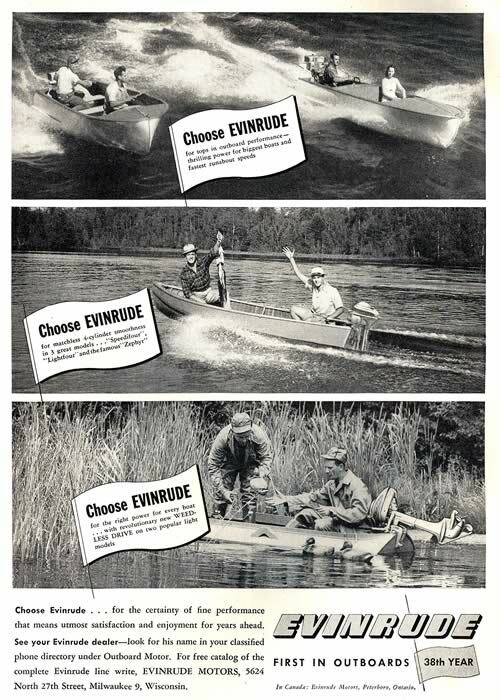 Compare Evinrude's light models against the field. 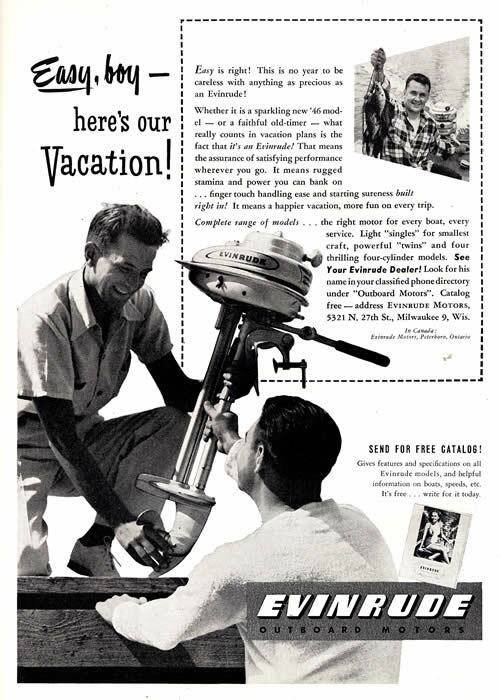 Check "fishing feature" after feature that Evinrude owners enjoy. 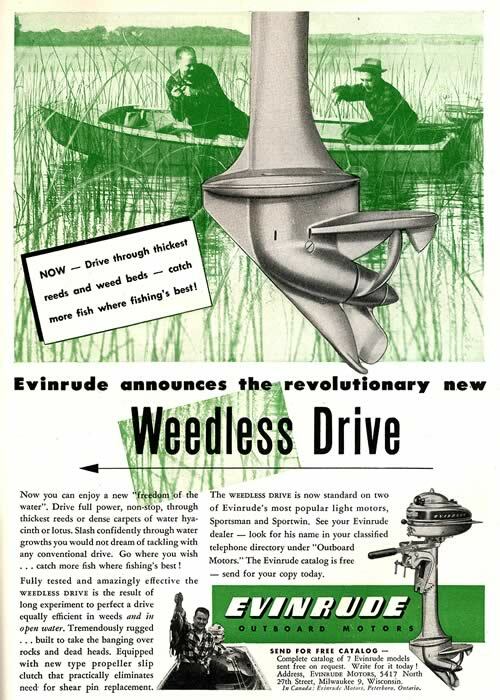 Think what the Weedless Drive alone is worth... there's nothing like it! 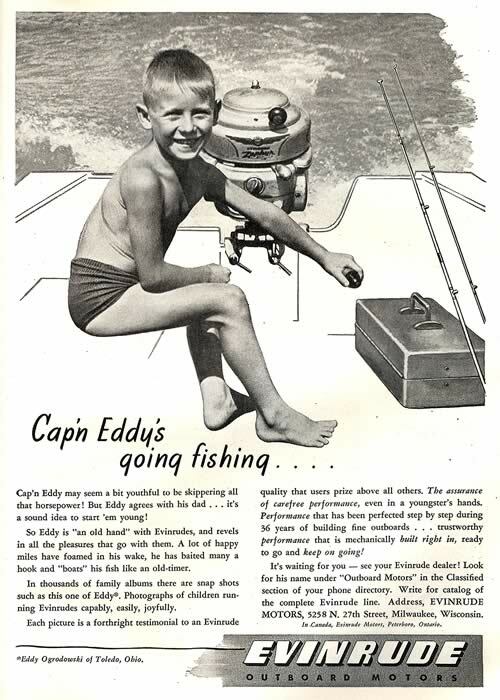 Gives you real "freedom of the waters" - the best fishing waters! 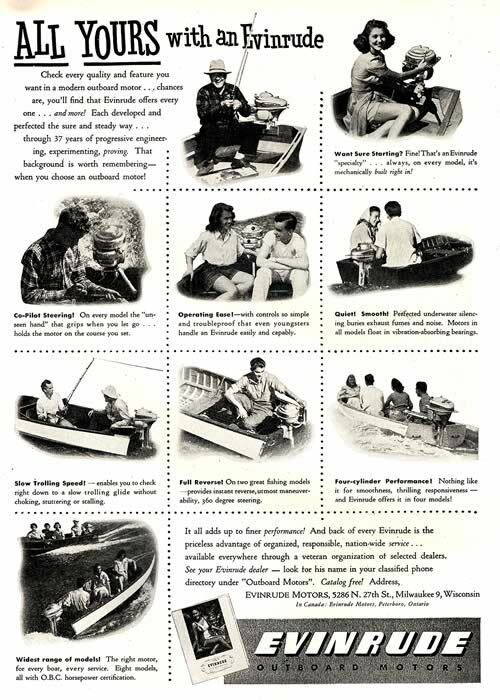 You can drive confidently through thick reeds and weed beds to where the big ones lurk... you can bang unworried over stretches foul with snags, rocks, stumps... you can go wherever there's water to float your boat! Study the host of sparkling features in the new Sportwin - you'll find even the gas gauge you've always wanted on your outboard motor! 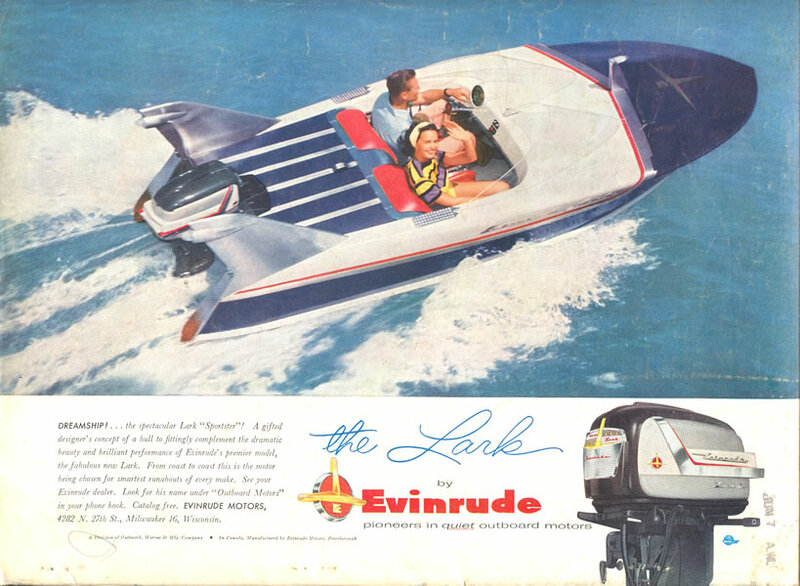 Years ago, Evinrude perfected a new kind of outboard motor, surpassingly smooth and responsive - a thrill to ride with, a joy to own! Today you can enjoy matchless four-cylinder performance in three great Evinrudes covering a wide range of power. 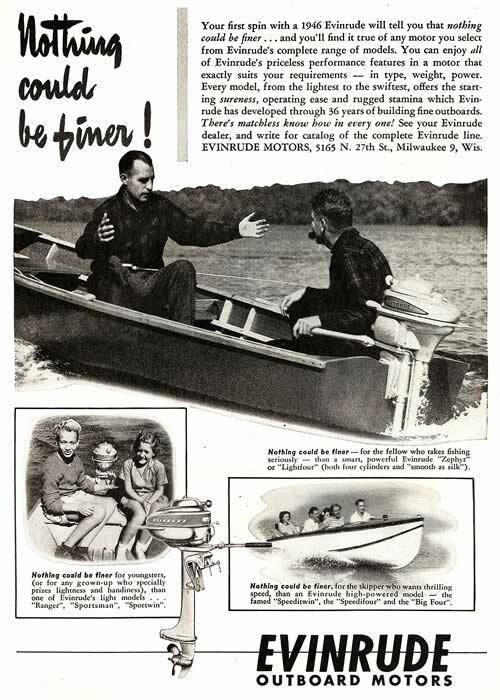 In the famed Zephry, it's yours in the popular 5-horsepower class - pedigreed four-cylinder performance for average fishing and family boats. 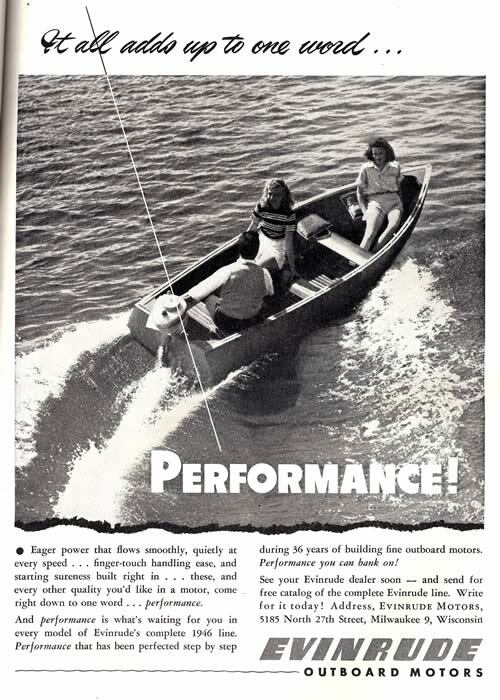 For powering light runabouts and fast fishing craft, the Lightfour, 9.7 horsepower*. 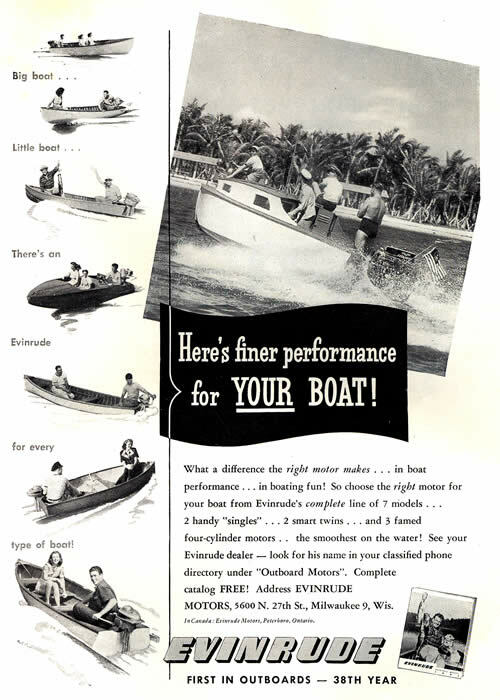 And for largest, fastest hulls, the Speeditwin and great Speedifour. *Power ratings are O.B.C. 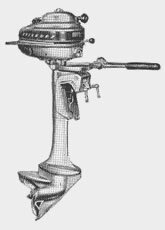 certified brake H.P. at 4000 R.P.M.